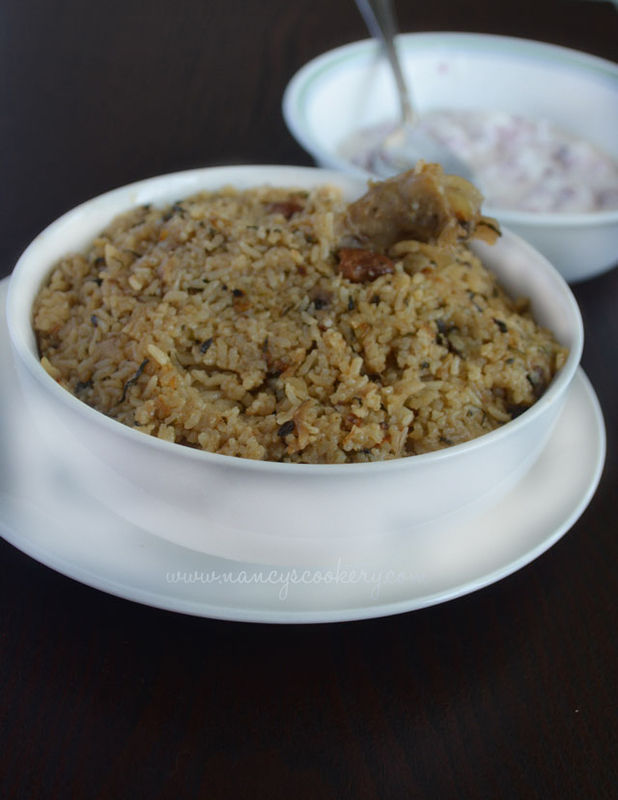 Dindigul Thalapakatty style biryani - The famous Dindigul thalapakatty biryani made with Jeera samba rice is most Tamilians favorite biryani. 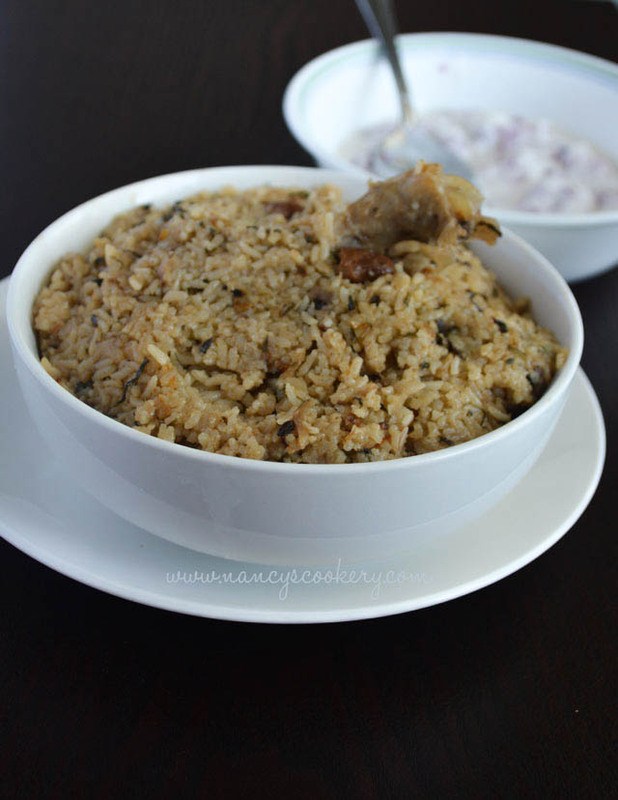 I made this dindigul thalapakatty biryani with coconut milk and Seeraha samba rice. 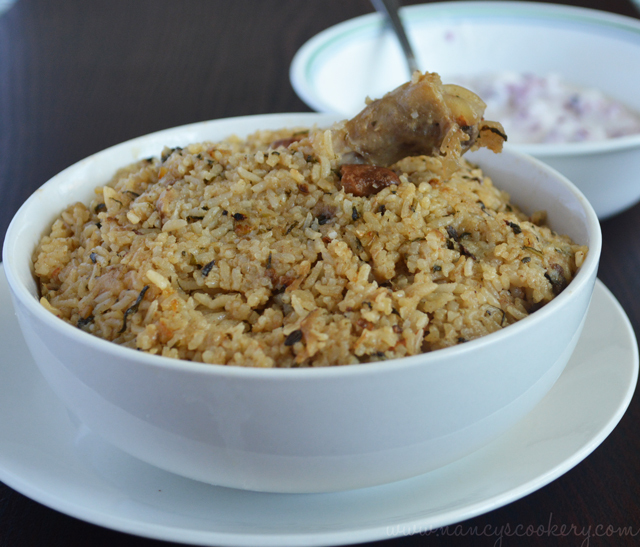 The seeraha samba / Jeera Samba rice is used in almost all biryanis in Thoothukudi but not in Chennai. 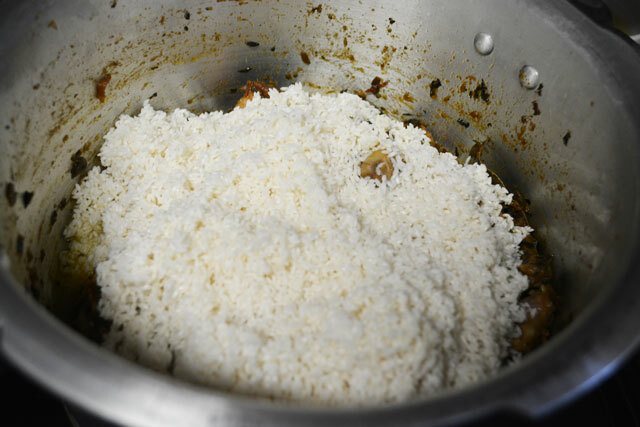 The rice Seeraha samba gives a unique flavor to the biryani and also the coconut milk. 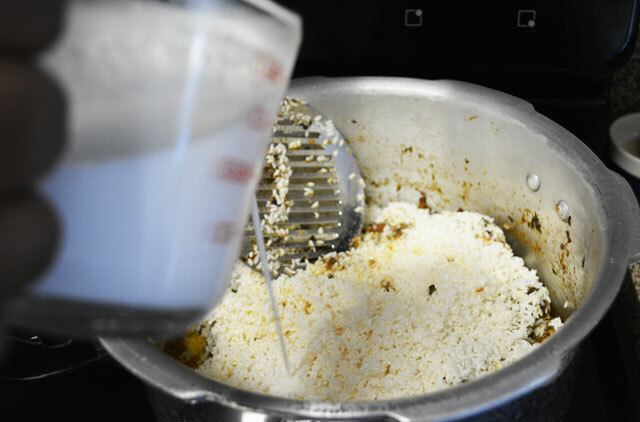 This biryani recipe is made with no store bought biryani powder and almost everything we grind in home for this biryani. 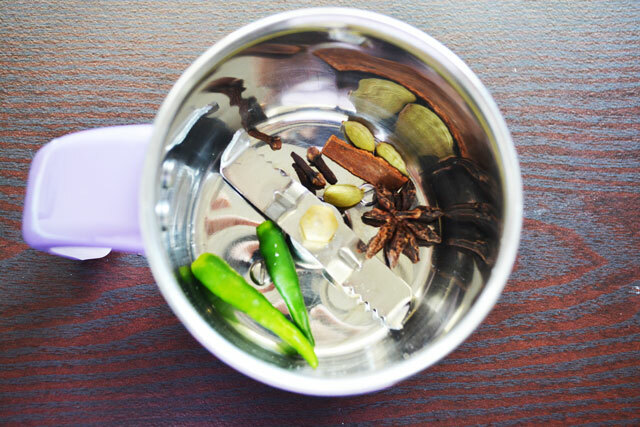 This recipe calls for more grinding and usually biryani recipe requires more stirring. But if you prepare for only your home, the recipe is easy. Get prepared for the grindings and stirrings. But it's worth the effort for the flavorful biryani. .
Biryani is made of amost all flavorful spices and the ginger garlic's aroma with mint and coriander leaves and delicious taste of coconut milk. 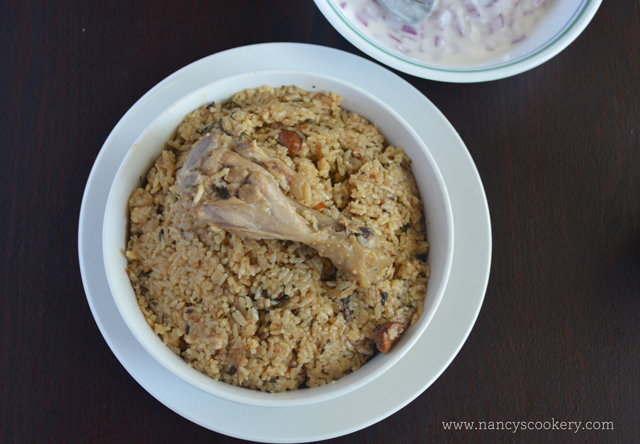 Use chicken pieces with bones, that gives a nice taste to the biryani. Try mostly to use fresh ginger and garlic paste instead of storebought, but mostly try to use the fresh ones , that's good for your health too. Grind the spice powder, ginger garlic paste and coconut separately given above in the ingredients list. 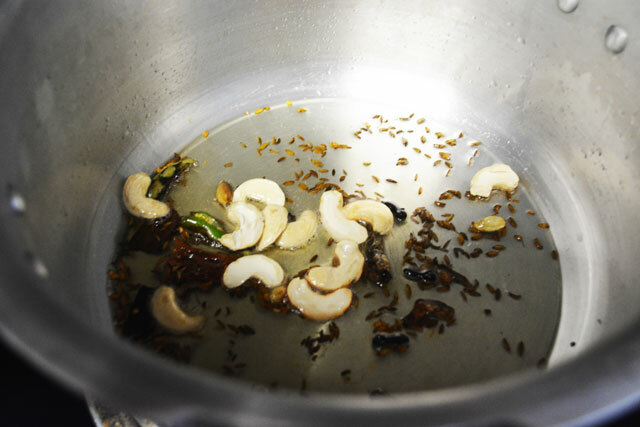 Heat oil+ghee in a pressure cooker and when the oil becomes hot stir in the whole spices cinnamon, cardamom, cloves, bay leaves and star anise.When the whole spice send the aroma and becomes bulged, throw the green chilly and the cashews in high to medium heat. After 30 seconds saute the onion with it. When the onion becomes fried and brown in color but not burnt, saute the tomato with them until the tomato is smashed. Then saute the ginger garlic paste with them until the raw smell goes off in medium to low flame. Now soak the rice in water for 20 to 30 minutes. 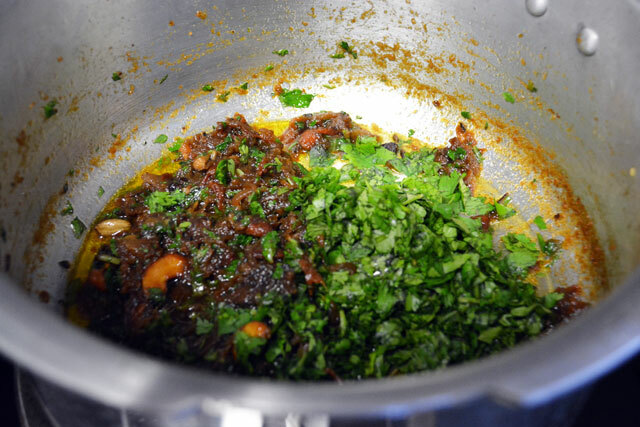 Then put the cilantro/ coriander leaves and the mint leaves and saute together with them for 5 to 10 minutes in medium flame. Saute the chicken , spice powder, salt, yogurt/curd together with the biryani masala for 5 minutes. 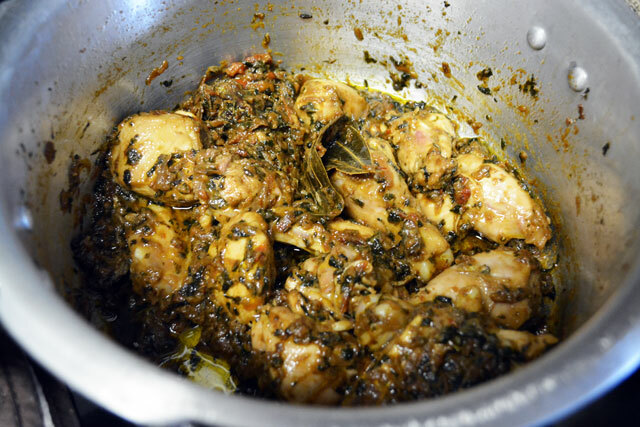 Then place the lid and cook for 15 to 20 minutes at medium to low flame for the chicken to absorb the masala. By the mean time , the rice would have soaked for 20 to 30 minutes. 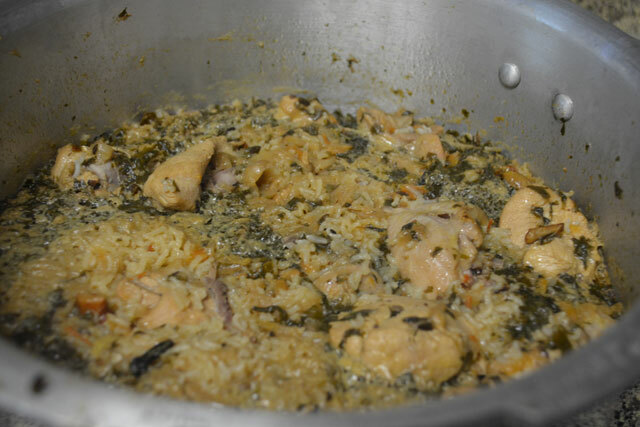 Now put the chicken, pour water, lemon juice, a little ghee and coconut milk to the above chicken biryani masala we got. Check for salt and required salt if needed. Pressure cook them for 3 whistles in a point next to high flame i.e. somewhere close to the high flame. After that, open the lid when the all the pressure is released, squeeze one whole lemon juice and stir the biryani gently with a fork without breaking rice. Serve it hot with raita/gravy/ fried sides. Get all the ingredients ready, Slice the onion, tomato and rest of the ingredients to grind. Take 1 cup shredded coconut, since I have only frozen shredded coconuts, I used this. 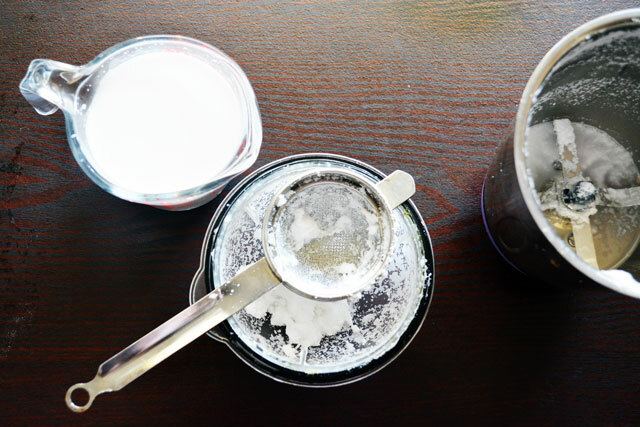 Grind it to fine paste by adding 1 cup water in a mixer to get 1 cup thick coconut milk. Pass the ground coconut through a strainer, to get the milk. Put green chilly and all the spices mentioned in spice powder heading under ingredients list in a mixer. 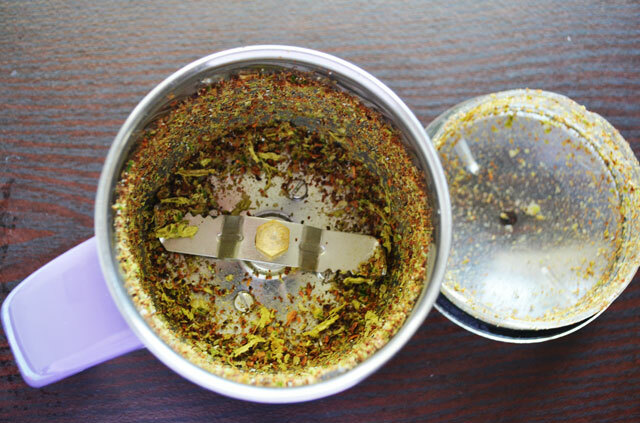 Grind it to a fine powder without adding water. Make the spice powder as fine as possible. If it has strands and won't grind anymore leave to that point. 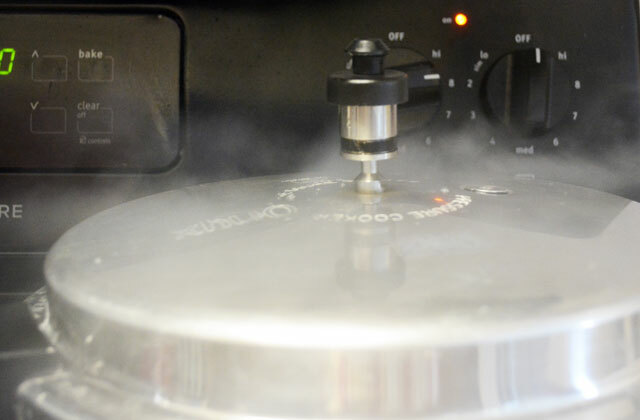 Now heat and oil in a pressure cooker. When the oil becomes little hot, put the whole spices mentioned in the ingredient list, cinnamon, cardamom, mace, cloves, bay leaf and and the other if I forgot to mention here which are in the ingredient list- the whole spices at a point close to high heat so that spices will be browned but not burnt. 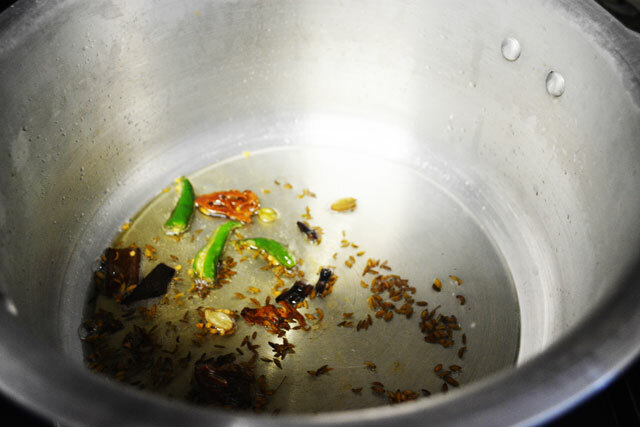 When the spices send their aroma and becomes bulged , throw the green chillies and saute for 30 seconds, if the spices start to burn in high heat reduce the flame. 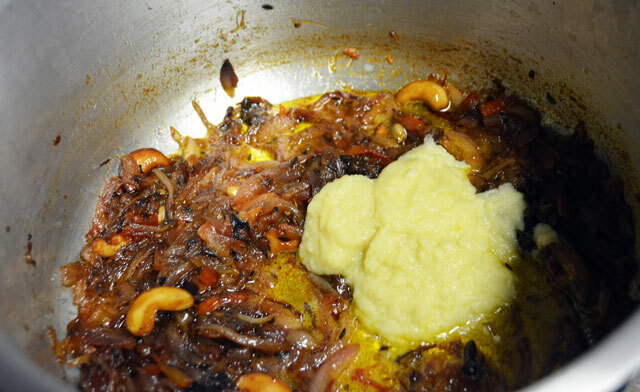 Now put the cashews intoit and saute until the cashews are slightly browned. 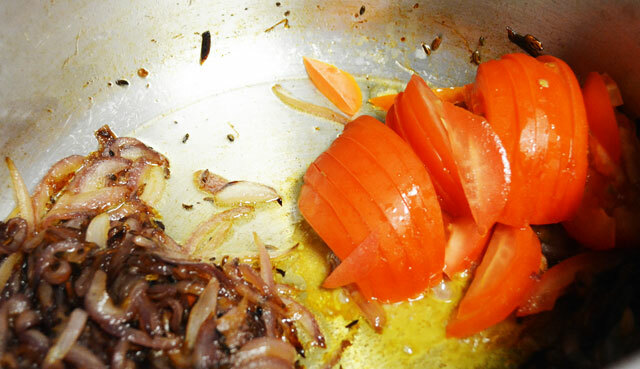 Now put the onion to the above and saute it in high to medium flame until the onions are fully browned and not burnt. At any point, at high heat, if you think the onionsare going to bbe burnt, reduce the heat and stir. 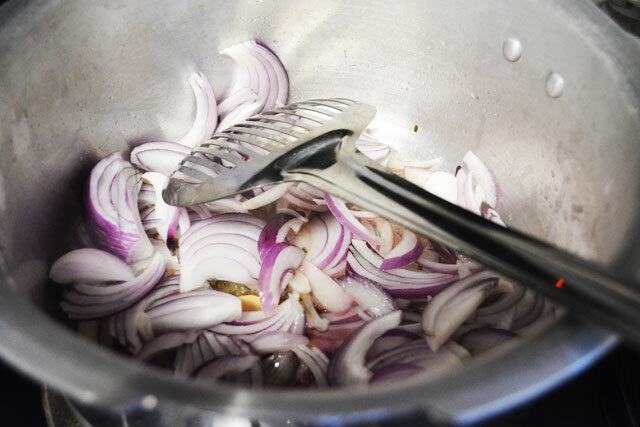 Stir the onions occasionally at short intervals to make them browned on all sides evenly. PUt the tomatoes and saute until the tomatoes are fully smashed. Stir them occasionally at short intervals. Now add the ginger garlic paste and saute them for 5 minutes or until the raw smell of the paste goes at medium heat. If you saute them at high heat, the ginger garlic paste will burn and stick to the bottom. STir them occasionally. Now take the Jeera samba rice and wash them with water for 2 to 3 times and soak them with enough water in a medium bowl for 20 to 30 minutes. Throw the coriander leaves/cilantro and mint leaves to them. The cilantro and mint leaves should be washed for if they have any sand particles and chop them finely. Then the stirring will be less, if you chop them finely. Saute them for 5 to 10 minutes in medium heat. Put the chicken, yogurt/ curd, salt and the ground spice powder. Saute them for 5 minutes at high to medium heat and then put the lid on and cook it for 15 to 20 minutes in medium to low heat. 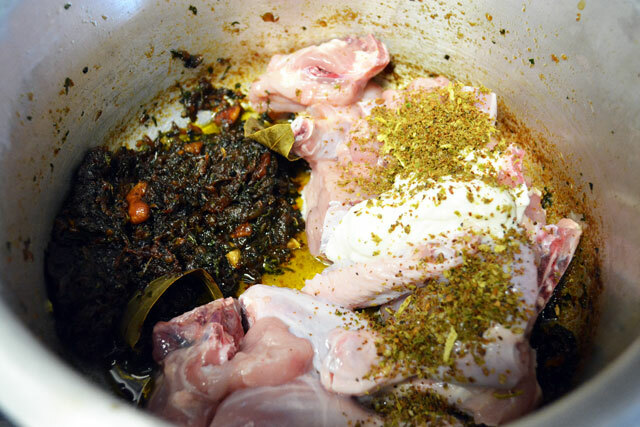 Since we are not marinating the chicken, we are cooking the chicken for sometime to get blended with the biryani masala. Now put the rice into the cooker. 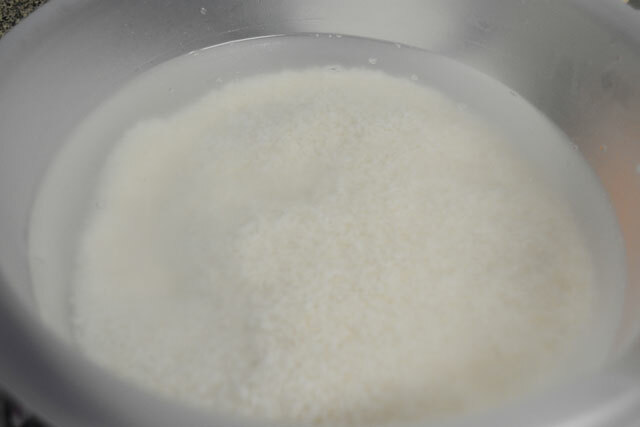 Pour the extracted coconut milk into them. 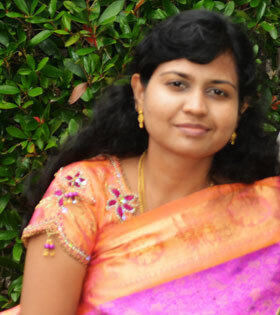 I asked hubby's help to shoot this picture. SO this is his hand. Take the juice from the lemon without the seeds and pour it into the biryani and and water also. I have given the measuremnets above in the ingredient list. Mix them well with a spoon/spatula and check the water for salt and add required salt as needed. Now put the pressure cooker lid on and cook for 3 whistles in high flame. 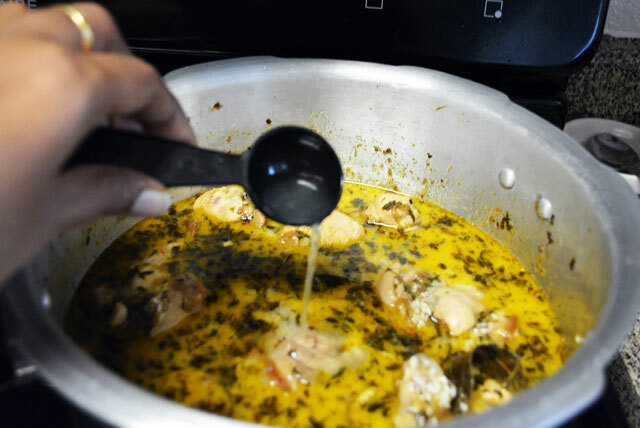 Once all the pressure is released, open the cooker, Squeeze one whole lemon juice and and stir the rice with a fork/spo0n/spatula without breaking the rice. The lemon juice adding at the last makes biryani a tasty biryani. Now the flavorful dindigul thalapakatti style biryani is ready. Serve the yummy biryani with raita or gravy with any fried sides . It depends on the sourness of the tomato and curd you used.. Mine was not sour at all. I had tried, tasted then posted after taste approval from my family.. So try using any one or whichever is less sour. 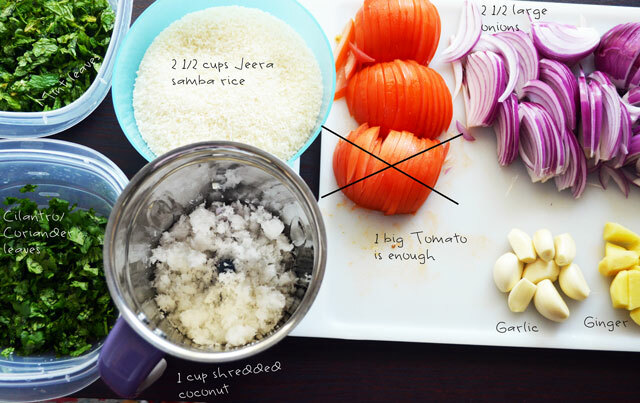 I'm planning to make this biriyani with basmati rice. How much water should I use for 2.5 cups of rice? Is it 3.25 cups of water + 1 cup coconut milk + 0.25 cups of oil ? Sorry for the late reply. the total water we use is 3.75 cups. If you are using coconut milk reduce the 1 cup of water from total 3.75 cups. Never miss our latest juicy bites.